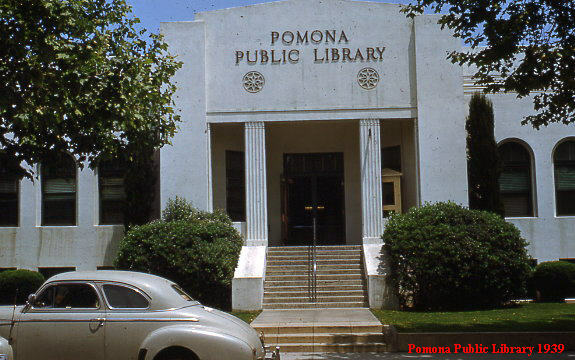 The Pomona Public Library began in 1887, and was originally located in a single room of the Ruth Block Building (pictured above) located at Third and Main. The Library was open for three hours, two afternoons per week, and the collection consisted of 400 books. The Library would subsequently move to three rooms in the Union Block Building, on Second and Thomas Streets in 1892. It remained at this location until the Carnegie Building was completed in 1903. On June 11, 1903, construction was completed on a new Public LIbrary Building, located at 380 North Main Street. The project was funded by a $15,000 grant from the Andrew Carnegie Foundation. The new building housed 15,000 books, and was staffed by a Librarian and two assistants. In 1912, the Library received a second Carnegie Foundation grant of $10,000, which added two wings to the library building, and doubled its size. 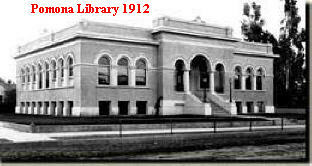 The original Carnegie Library building, completed in 1903, and expanded in 1912, was enlarged for the last time in 1939. The building was finally closed in 1965, when it was replaced by the current building.